Spacious, comfortable & quiet studio flat with the most amazing private garden you will ever see. Literally a stones throw away from Notting Hill Station and smack bang in the middle of Notting Hill. You’ll love my place because of the outdoors space, the neighbourhood, and the ambiance. 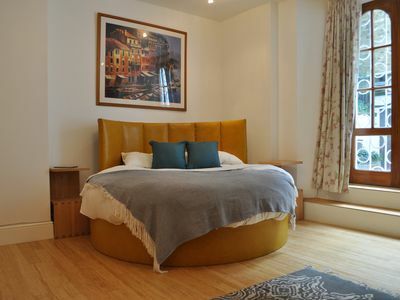 The flat is superbly located in the centre of Notting Hill. The flat is on a quiet street and is a superb sanctuary to come home to after a big day out in London. The studio is large and will comfortable sleep 4 people if required. There is a 6 foot round bed and a double sofa bed in the main room as well as a large TV. Our cleaners place fresh, hotel quality linen on the bed just before your arrival. The bathroom consists of a lovely double headed shower over the bath. The kitchen has a dishwasher & there is a washing machine for you to use. The private garden is beautifully decorated and has two sets of dining furniture if you wish to dine el fresco or just hang out in the lovely garden.